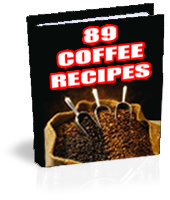 This superb ebook has an amazing 89 recipes for coffee and is available in both Adobe PDF and Windows .exe versions so that no matter whether you have a PC or an Apple Mac you can enjoy these caffeine compliments! The PDF version is 91 pages long and has a recipe per page so you can just print off a single page rather than the whole ebook whenever you fancy a different brew. Check out the list of recipes below. Both ebooks come with full master resale rights as long as they are not modified in anyway.